Meet our team at IM PEDIATRICS PC! Please take a few moments to learn about our skilled practitioner and our friendly, nurturing staff. At IM PEDIATRICS PC, we consider it both a great joy and responsibility to care for children. Most of us are parents ourselves, so we strive to be understanding and available to the families we are privileged to serve. We are honored that you have chosen us as your child’s primary medical provider and are confident that you will be pleased with the quality of care and service that we can provide you and your family. A vital part of our service to children begins with our outstanding staff who works hard to manage and maintain a professional, caring and supportive environment for our patients in a timely manner. Our doctor is a lifelong learner. Not only has she received advanced medical training in pediatrics, she continually pursues ongoing education to stay on top of the latest in child health care. Your child’s health is as important to us as it is to you. We look forward to providing you with excellent pediatric care in the Ridgewood area. 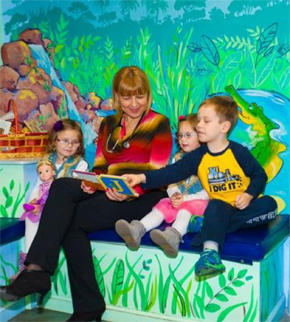 "I WAS BORN TO BE A PEDIATRICIAN"
Dr. Iwona Mienko is a Board Certified Pediatrician and a Fellow of the American Academy of Pediatrics (FAAP). Dr. Mienko has received her medical degree from the Medical Academy at Lodz , Poland, where she worked as a Pediatrician. She was rewarded a certificate of Educational Commission for Foreign Graduates in Philadelphia, PA and completed her pediatric residency at Maimonides Medical Center in Brooklyn, New York. Dr. Mienko has worked in Pediatric Intensive Care Units (PICU) and Neonatal Intensive Care Units (NICU), Emergency Departments and Pediatric wards at Lutheran Medical Center, Coney Island and Interfaith Hospitals. After extensive training in neonatal, child and adolescent care she opened her private practice in Ridgewood. As a Queens resident she lives with her family and stays close to her office and patients. She has devoted her personal life and professional career to raise not only her own kids but all of her patients as well. She dedicates her free time to help sick kids and orphans by volunteering for The Children’s Smile Foundation of Queens, NY. With over 20 years of diverse medical experience and being a mother of two children, Dr. Mienko is a passionate pediatrician. She cares deeply that parents and their children learn about the issues of growth, development, behavior, preventive health and management of illness while receiving the best treatment they need.